I went to two matches in the weekend just gone, and one of them has already been covered by Daniel Colasimone over on the excellent Argentina Football World, so if you want to read about Tigre vs Quilmes, you can do so here. 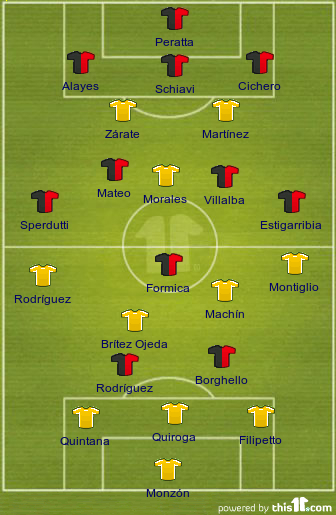 Although Huracán vs Newell’s was nowhere near as good a game, it seemed silly to duplicate, so I’m stuck with this one. Huracán vs Newell’s really wasn’t the best game (I know how to sell these, don’t I? ), but it contained some superb pointers on why 3-4-1-2 isn’t the best formation to play at the top level. And not an awful lot else. But you want to read on anyway… don’t you?! 3-4-1-2, you see, leaves the wide midfielders in the 4 constantly looking over their shoulders when the opposition spread the ball to the flanks, and thus blunts its very own supposed attacking advantage. On Friday night, both teams used this formation – although Newell’s were perhaps playing more of a 3-4-2-1 – and both goals, just as Mr Wilson suggested before the game, came from moves beginning with breaks into the space at the side of the defence. Prior to the game, both sides had gone through mixed starts to the season. 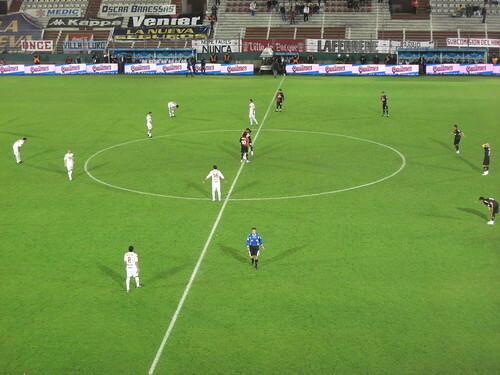 Hosts Huracán had begun by beating defending champions Argentinos Juniors 2-1 away from home, before losing successively to River Plate and Arsenal. Newell’s, after losing the opener at home to Estudiantes, had improved results-wise in the next two games, first drawing away to Lanús and then beating Tigre in the third round. Neither side had very high expectations coming into this fourth round match, and that turned out to be just as well. The first goal, Rolando Zárate’s first since joining Huracán during the winter break, was provided by Carlos Montiglio after a great pass from Marcos Brítez Ojeda into the right-hand channel left the midfielder with a simple pass to knock into the centre of goal, eliminating Sebastián Peratta in the Newell’s goal. In truth, it came less from a specific fault in the formation than from a breakdown in defensive concentration on the parts of Gabriel Cichero and Rolando Schiavi, who should have been picking up, respectively, Montiglio and Zárate. All the same, it wasn’t the first time the ball had been played into a similar area, and it had seemed only a matter of time before the pressure told. That opening goal came just minutes after Schiavi had seen his penalty saved by Huracán goalkeeper Gastón Monzón following a challenge from a corner on Mauro Formica which earned Gastón Machín a booking. It wasn’t a golden evening for Schiavi, who has had and will again have more commanding performances at the heart of Newell’s back line, but he was able to regain his head sufficiently to marshal his defence far more effectively from that point on. The remaining 70 minutes of the game saw space frequently opening up to either side of the two teams’ defences, but a marked reluctance from either side to capitalise on that vulnerability by switching the ball rapidly from one side of the pitch to the other. Machín, in spite of his early blunder in giving away the penalty, was Huracán’s most impressive midfielder; comfortable and efficient on the ball, and hard-working off it, whilst Brítez Ojeda alongside him sat deeper, screening his defence well and – as with his pass to help create his side’s goal – using the ball to good effect when he did venture further forward. For Newell’s, Formica was clearly the best player, even though by his standards he had far from the most impressive game. Creator of the equaliser when he crossed from the right (a ball that might have been much more easily cut out had there been a full back in the way) and Mauricio Sperdutti lashed home the knock-down after Facundo Quiroga failed to clear properly, Formica was dangerous throughout, if sometimes susceptible to hang onto the ball slightly too long. Iván Borghello offered little ahead of him though, and Luis Rodríguez, who was supposedly playing in a slightly deeper-lying role just alongside Formica, might as well not have been on the pitch for large patches. In terms of classic number 10 play though, Formica’s ordinaryness was light years ahead of Ángel Morales for Huracán. At 35 years of age, and having played for the likes of Independiente, Sampdoria, Racing and Nacional among others, Morales really ought to have a bit more intelligence in this position than he showed on Friday night. Constantly running down blind alleys, he tried, consistently and invariably unsuccessfully, to take the ball wide when cutting into the channels, rather than moving inside to try and work a pass or a shot on goal. He was replaced by 23-year-old Mariano Torres (‘why’s he wearing number 9, and playing in midfield? !’ asked one scandalised fan in the row behind me) with 17 minutes to go, and within five minutes Torres had had two shots on goal and tried a couple of passes into the box – more than Morales had managed in the entire match. It wasn’t enough, though. Huracán look decent, if toothless, with the ball, but desperate without it, and were really lucky to hang on for the draw by the end. They deserved to have the lead at half time, even taking into account Schiavi’s saved penalty, but in the second half Newell’s were far superior and could easily have won the game after Sperdutti’s 49th minute equaliser. For Huracán, a high mid-table finish looks the highest target to aim for, though in Montiglio, Machín and Brítez Ojeda they have at least got a very solid and cohesive midfield unit. Newell’s might do better if their forwards can get their shooting boots on, and either side would be well advised to move to four at the back – in Newell’s case Marcelo Estigarribia, who played wide left in midfield on Friday, would make a decent left back. Neither side, though, will be challenging for any honours come December. At least, not on this viewing. Sam, one small thing you missed on Schiavi’s penalty… sticking to the letter of the rules, he should have been given another crack at it as a Huracan player clearly entered the area before he struck the ball. Still, for all the penalties I’ve seen El Flaco take, I have to wonder why he keeps taking them. If I haven’t lost count somewhere, I’ve seen him take four such, and only score directly from the spot twice. That’s not exactly stellar, now is it? The last time that style of play was successful (to a degree) for La Lepra was when both Salcedo and Cardozo were still around. Very good point on the penalty, David. It wasn’t immediately apparent from the stands, of course, which is why I didn’t include it. Well, that and having had a few drinks with Dan prior to doing this write-up, I forgot about it. Well done to write so much about that game. I would have liked to hear more on the Schiavi – Sandra Bullock rumours though. Sam, did you see anything interesting on the way to the ground?